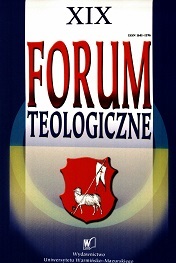 The “Theological Forum” is a periodical of the Theological Faculty of the Warmia and Mazury University in Olsztyn, founded in 2000 and appearing annually. REVIEWS AND REPORTS (presentations of monographs; reports from conferences). Since no. 5 (2004) all the issues have had a main topic, dealed with in several articles. The remaining pages contain miscellaneous texts, mainly on theological subjects. This periodical deals with various theological problems, interdisciplinary topics, touching points between theology and other scholarly disciplines. The editor commit oneself to use the highest standards of publication consistent with the requirements of ethics. Detected cases of scientific misconduct are documented and explained. In the publication of materials the editors are guided by the substantive evaluation of the text, based on the opinion of specialists expressed in a written review – in accordance with accepted standards. The authors are treated equally regardless of the degree or title, age, gender, affiliation and any other circumstances (eg race, nationality, citizenship, ethnicity, worldview). The submitted texts are not used in any way, which is not inconsistent with the Author. there is no conflict of interest between the author or authors and reviewers indicated on the “Theological Forum” website, resulting from direct personal relationships, professional subordination or direct scientific cooperation in the last two years preceding the year of submitting the article for publication; in the event of such a situation, the author indicates these persons. Persons who in any way participated in the research project – but their contribution is not enough to recognize co-authorship – the author makes a thank-you note attached to the text. If the author detects errors in his / her text, he / she reports the problem to the editorial team and cooperates with the editorial office in order to rectify or withdraw the text from the publishing procedure. The reviewers commit themselves to objectivity in the assessment of the text, guided by its substantive value and the formal correctness. If a conflict of interest is detected (eg in case of author identification) or suspicion of plagiarism, the reviewer is obliged to notify the editorial office. Reviewed texts are treated as a confidential document, and the results presented in reviewed papers are not used by the reviewer in any way until the text is published. The adopted publication policy principles are against the ghost authorship and guest authorship. In the remaining scope, the editor keeps the COPE standards.